Zebedee, Jo. 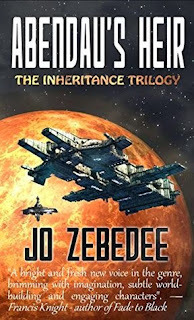 Abendau's Heir. Tickety Boo Press Ltd, 2015. Let me ask you this: do you agree with B.F. Skinner, that the human mind is infinitely malleable, a blank slate onto which a skilled behaviorist could write whatever s/he wants? Would you still be you if you'd been raised by someone else—an evil Empress, say? If you answered 'yes' to any of this, then the central conceit of Abendau's Heir will be convincing to you. But recent studies suggest limits to the malleability of the human personality outside the context of deeply traumatic events. Though the scientific literature is by no means conclusive, there are reasons to theorize that the development of one's personality may have more to do with genetics than who raises you or in what sort of environment. 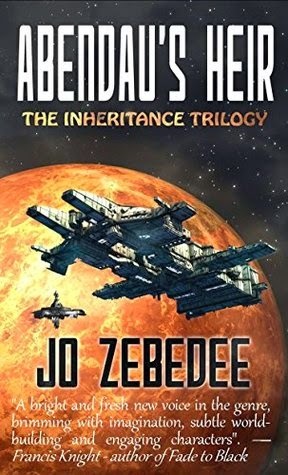 On one level, Abendau's Heir is about an evil telepath Empress who rules a multi-planetary, multi-system Empire (actually more like a coalition of Great Families) and will stop at nothing to recover the child Kare, the product of her union with an (unwilling) resistance leader with psychic gifts. It's a multi-decade tale, with the majority of the exciting stuff occurring when the powerful psychic Kare is between the ages of 17 (the age when, out of options, he joins and eventually rises through the ranks of the resistance army and tries to avoid becoming a political pawn of the Great Families) and 25 (when some other stuff happens). But that's just the political stuff. It's equally a love story between Kare and Sonly, and many aspects of that love story were appealing to yours truly, what with my sentimental romantic nature. Who doesn't want to believe that love will conquer all, including some pretty grim stuff? Certain aspects of the interface between the romantic tale and the political tale didn't quite convince me, however. Characters occasionally make terrible, hare-brained decisions that no one would ever make. I can't go into specifics without giving much of the story away, but just imagine you had the power to heal your best friend's mortal wound, and could do so if you just killed the bad guy everyone hates anyway; would you really choose to preserve the bad guy's life at the cost of your friend's? (And it wouldn't take much effort to kill the bad guy, since you can break bones with a thought!) That's not much of an ethical dilemma—no one on earth would let their friend die so that their enemy could go live in a padded room somewhere, and the only reason to have this sort of scene is to increase the melodrama, the emotional toll on the main characters. It doesn't sit very well with me that characters, who otherwise seemed like rounded individuals with coherent goals and whatnot, would suddenly act like meat-heads in these key, emotionally charged moments. That goes for the bad guys, too—why betray your cause and your own family over such a petty grudge? And if you're the sort of person who is capable of that (i.e., a sociopath at best), why didn't people notice it sooner and cut your arms off, or whatever? All that said, it's quite an entertaining story, and for the most part the melodramatic excesses, which force characters into out-of-character craziness, is a minor distraction. My one word of totally unsolicited, impractical advice to the author is: next time, more bunnies! Bunny-lover (but not in an icky sexual way!) Zhaoyun has always preferred rainbows to grim stuff and has been saying so here at Nerds of a Feather since 2013.